What is a Titer Test ? 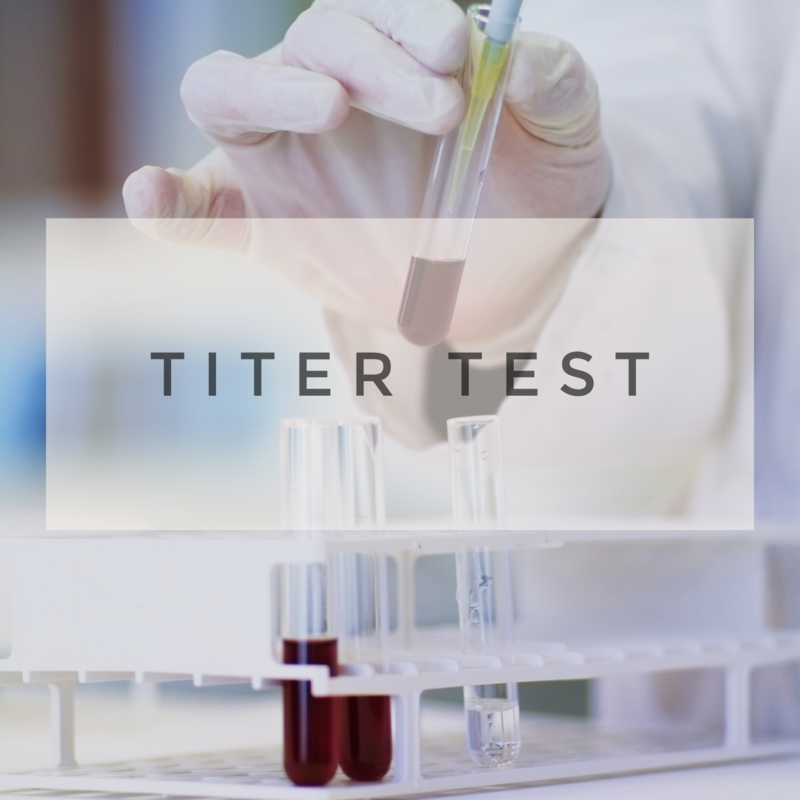 A Titer Test (pronounced TIGHT-er) is a simple blood test used to check your PupSize dog’s level of antibodies, to help you decide and your veterinarian decide, whether you dog needs their next vaccinations shots. A Titer Test is also referred to as titering, serum vaccine antibody titering or serologic vaccine tittering. If you are like me, then you must find it a little disturbing that the vaccinations given by your veterinarian, to your PupSize dog, are the same dose given to medium and large dogs. I usually get an email or postcard in the mail from her vet, letting me know if is time for her shots, and it’s always so hard for me to decide if and when my PupSize dog should or needs to get a vaccination. Some say that titer testing may be the solution to over-vaccinating. From what I understand, a Titer Test is a laboratory test available to measure the existence and level of antibodies to disease in your dog’s blood. Antibodies are produced when a virus or bacteria (an antigen) provokes a response from the immune system, that can come from vaccination or from natural exposure. My veterinarian recommended that we test to examine the antibodies for both parvovirus and distemper, the two most important viruses. Rabies titers is something else they can test for and I was told that usually, testing for other diseases are generally not considered useful or necessary. A Titer Test can help you decide and determine if your dog requires additional vaccination, saving your PupSize dog from unnecessary shots. The test can also help determine if puppies have received immunity from vaccination or when adopting a dog, it can help to see what vaccines may be needed. Most experts believe a titer test results are a reliable indication of a dog’s immunity level. Some groomers, boarding facilities and airlines may accept test results in place of proof of vaccination, but please check with them to see if this is acceptable. How often should I Test Titers? You’re going to have to decide for yourself and consult with your trusted veterinarian, some recommend testing yearly, but this can be expensive. How Much Does a Titer Test Cost? The cost of a Titer test will vary based on your veterinarian. I’ve spoken to Pet Parents who have told me it cost between $80 and $200. For me, the cost of doing a Titer Test is a small price to pay to know that I am not over vaccinated my precious PupSize pup. *As always, please consult your veterinarian or an expert of this subject. The intention of this post is to just provide information from my personal experience and what I do for my PupSize dog. Service Dogs, Emotional Support Animals, Therapy Dogs…What’s the Difference?